Do You Have a Job, Career or Calling? Samantha Boardman, writing for the Huffington Post, discusses the differences between jobs, careers, and callings. In the article, she mentions Jane Dutton, as well as Adam Grant and Amy Wrzesnieswki, members of the CPO Research Advisory Board. “Of course, just having an ethics and compliance program is not enough – such programs can be little more than varnish to otherwise seedy operations. “‘It takes a little bit more work than an ethics and compliance program,” says David Mayer, a professor at the University of Michigan’s Ross School of Business and a researcher at EthicalSystems.Org, an online hub founded last month to help businesses bolster their ethical performance. Ann Arbor, Mich. – Feb. 18, 2014 – The University of Michigan’s Ross School of Business today unveiled the roster of high-profile speakers that will address attendees at its inaugural Positive Business Conference, which will take place May 15-17, 2014 at the Ross School of Business. C-level executives from companies including Whole Foods Market, Ford and Procter & Gamble will take the stage to share the most inspiring and practical positive business practices currently in place at their organizations. With a number of academics presenting and conducting workshops alongside world class business leaders, the breadth of business topics that will be addressed will make the conference a unique experience for all attendees. The three-day Positive Business Conference will bring together the diverse perspectives of business professionals, academics, students and industry luminaries. The conference will host sessions with both practical examples of positive business practices being implemented, as well as workshops based on the cutting-edge research underlying the practices. Select Ross faculty will lead interactive workshops on specific approaches to building positive businesses across a range of disciplines. Will Yakowicz (Inc. magazine) interviews Chris White, Managing Director of the Center for Positive Organization, about recent leadership trends. It’s no secret that Americans live in an age of perceived polarization. We hear updates on the news about the latest political clash, we take stances on issues and might even consume media based on those stances. To an outside observer, it might seem that Americans are always at odds with each other, barely able to agree on where to go for lunch. Dr. Wayne Baker offers a different perspective in United America. Americans are united by Ten Core Values, values they have held for a long time, he says, and these values hold true despite differences in demographics like age, race and political leaning. Kristen Weir of the Monitor on Psychology (a publication of the American Psychological Association) highlights research “showing that meaningful work is good for the worker and for the company — and that even employees in tiresome jobs can find ways to make their duties more meaningful.” In the article, Weir quotes Jane Dutton describing how individuals can redefine their jobs to be more personally meaningful through job crafting. This study is being run by Melbourne University and its goal is to identify the best set of questions to use when measuring gratefulness. Lea Waters, one of the supervisors of this study, presented her research at the Center for Positive Organizations in November. On livehappymagazine.com, Patton Dodd quotes Kim Cameron and Jane Dutton in a feature on the application of research findings in positive organizational scholarship by then-CEO John Y. Kim—including institutionalizing forgiveness, resilience, supportive communication, and employee empowerment—during a difficult merger at Prudential Retirement. The Center for Positive Organizations +Lab student fellows participated in a Reciprocity Ring and will have the opportunity to collaborate with CPO Partner Humax Corporation on a beta test for a mobile app based on the Ring. Congratulations to The Motley Fool and CEO Tom Gardner for being named the best medium-sized company to work for by Glassdoor! The anonymous employee reviews of The Motley Fool on Glassdoor reveals some of the reasons The Motley Fool earned this award: employees remark on the high level of autonomy they enjoy, ample opportunities for professional development and advancement, and the collaborative environment. In May 2014, Gardner will speak at the Positive Business Conference hosted by the Stephen M. Ross School of Business. 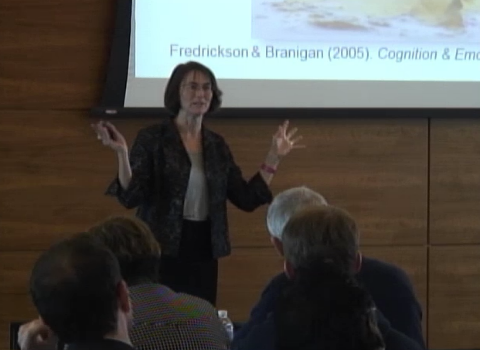 Barb Fredrickson, a leading scholar on positive emotions and human flourishing, returned to the Center for Positive Organizations to share the latest developments in her research on positivity. Barb first presented at Positive Links 10 years ago, and we are grateful for her membership in the community of Positive Organizational Scholarship researchers worldwide.